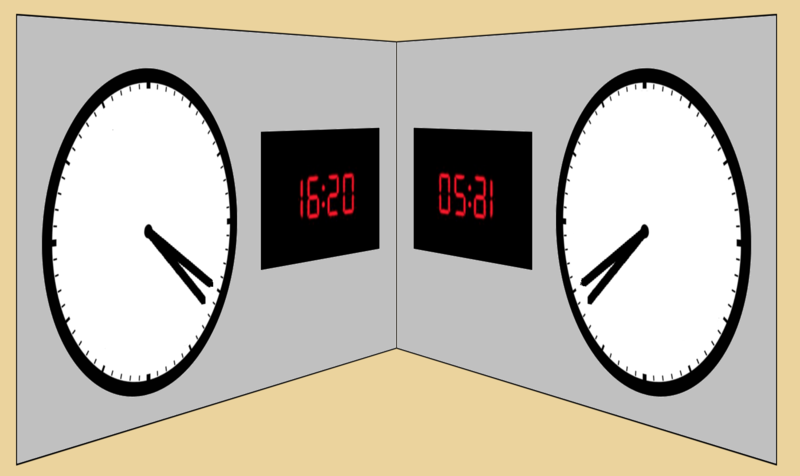 Triangulating for the simplest puzzle that is still at least somewhat interesting to solve..
During the course of a day, which of these clocks agrees more often with its horizontal mirror image? The same as the times that the analog clock has reflective symmetry across it's "y" axis. This will happen at least once an hour. The proof for this involves the Intermediate Value Theorem, but essentially boils down to the fact that, every hour, the hour hand continuously sweeps one part of the clock, while the minute hand continuously sweeps the entire clock. It follows that, in sweeping the entire clock, it must for an instant pass through the part of the clock that is currently opposite the hour hand. It actually matches slightly more often than this, because they're already matching at noon/midnight, so it comes out to 13 matches every 12 hours, or 26 total. As suggested by DqwertyC, the analogue clock will agree 26 times in 24 hours if you include both mid-nights. If you argue that there is only one midnight in a 24 hour day then this can be reduced to 25 times. Assuming the latter these times are approximately: 00:55, 1:50, 2:46, 3:41, 4:37, 5:32, 6:28, 7:22, 8:18, 9:14, 10:09, 11:04, and 12:00 plus the equivalent times in the afternoon. As suggested by Dorrulf and DqwertyC there are a minimum of 4 times when the digital clocks agree (if only (2|5), and (0|0) digits are considered to be mirror images, and a maximum of 11 times if (1|1) is also included. Either way, 12 (or 13) trumps 11 (or 4), so the analog clock wins. Those matches occurs twice per day since the hour handle makes 2 complete turns by day. (13 + 1) × 2 = 28 matches. The analog clock matches more often. To me, the question asks particularly about when the values of the clocks read the same value on either wall, rather than just being exactly visually identical. This matters primarily for digital in that as long as the reflection shows actual numbers, and the value of said numbers is equal to that of the left wall, I count it. Essentially, the padding of the 1 doesn't matter, thus 11:11 is acceptable. f(y) = +-|x| for -3 <= x <= 3 where x is an integer. The result is 13 points. Now, if you think that 12:30 should qualify and that the hour hand isn't off kilter enough to dissuade you, then you should also accept that the -0 and +0 y values in the function are different points, which would bump the results to 14. Given that this is only for a 12 hour period, we can double those numbers resulting in either 26 or 28 total values. The clock value must read the same forward and back (palindrome). The right side is limited to values between 0 and 24 (military time). The left side is limited to values between 0 and 60. Basically, the right side is the only one that matters, and the left side's tens position restrictions fall to the right's ones position, and the left's ones position restrictions fall to the right's tens position. As 3, 4, 6, 7, 9 are not reflective, and 8 is too large. This boils down to 11 results. The leading 0's and set to military time. Again, if we function with the idea that as long as the times read the same (and the positions don't have to be exact - left oriented 1 versus right oriented 1), then we have these reflective cases: 0 to 0, 1 to 1, 2 to 5, 5 to 2. We can't use 8 because minutes only goes to 60. This gives us the following combinations (barring any were missed): 01:10, 11:11, 10:01, 15:21, 12:51, 05:20, 02:50. @DqwertC also found: 00:00, 02:50, 20:05, and 22:55. That puts us at a ration of 8:11, in favor of the digital clock. Not the answer you're looking for? Browse other questions tagged visual geometry time or ask your own question.